In our new monthly instalment ‘Creative Encounters’ we interview professionals within the design, architecture and arts world. 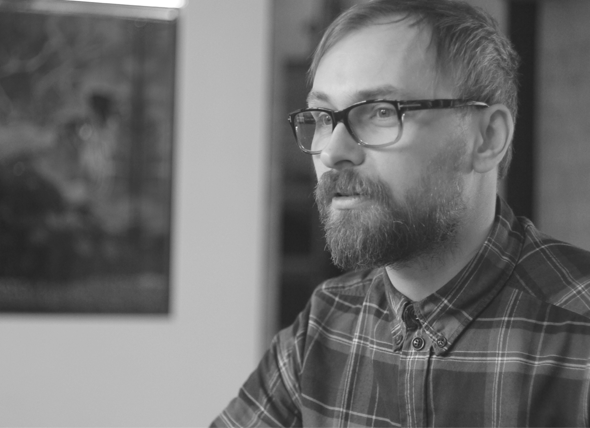 This month we interview Nick Wills, Senior Graphic Designer at I-AM. Nick has been overseeing our team of designers on a number of projects and developing strong ideas and stories, for the last three years. What first attracted you to design? I rather fell into design. I always knew that my career would be creative, but exactly where I was unsure. Graphic Design was not a widespread subject throughout my education. The first time I became fully aware of how suited I was to it, was discovering it during my foundation year. Up until then illustration had been my focus. Both are commercial enterprises and that interested me far more than other self-initiated creative avenues. I have always been a problem solver at heart and the opportunity to understand and improve what I saw was very appealing to me. It was a definite awakening that year, throwing myself into discovering as much as I could about agencies and other designers. The power to improve our environment through clear communication rather than the poorly considered design that unfortunately litters our daily lives is a powerful driver. How is the role of 2D changing compared to when you started? I think there is now much more emphasis on helping our clients understand the value of design; how it can best achieve effective results, and the difference between what is ok, what is good and what is great and the reasons why. As a visual and commercial discipline, design falls into a category where everyone has an opinion, whether justified or not which means our solutions must always have a strong foundation in reasoning and stand up to scrutiny. It is important to help understand why one answer is better than another when people are often dealing with elements that may be completely foreign to their day-to-day decision making. I am inspired now, as I have always been, by an appetite for knowledge of everything around me. For me, the most appealing part of the process is the understanding of the client, their market, their audience and what they want to achieve. Design is quite unique in the fact that there are few professions where you have to know about everyone else’s to truly create the most successful outcomes. It is this that continues to inspire and retain my interest, 16 years since I began my career. How can design provide value to brands? Are there any particular brands or branding you admire? Design might not be noticed or it might be in your face, but good design should always improve people’s experience. Whether that is expressing a brand, navigating a space or a website or grabbing somebody’s attention and giving them something to tell their friends. Good design provides a cohesive story through every touch point. It should be a fluid and seamless journey with no discordant notes. It should communicate, it should look great and most importantly it should be effective. Bad design sticks out like a sore thumb and studies have shown that a bad experience outweighs a good one in your memories. That is why we always seek to create the best experience we possibly can. Good design can generate loyalty and advocacy, improve efficiency and reduce costs, and even make people smile. A great story that makes me smile is that of Hiut Denim – the singular focus inspires their tone of voice and creates an engaging and memorable brand.